The end of the nerve can be a “Big Bang”, “a slow whimper”, “an occasional annoyance”, or “a non event”. Basically bacteria have entered the nerve space in the root canal within the roots. The reaction by the body depends on the type of bacteria present, the quantity, the person’s immune system, the size of the canal, and length of time. 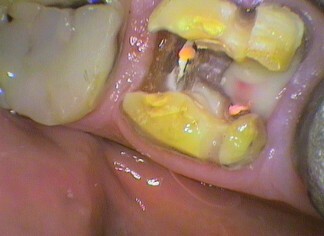 Are the bacteria just within the root canal or are they in the bone surrounding the end of the root? An xray will only show a reaction in the bone but no definite soft tissue changes within the root canal space. This is the most painful scenario to avoid in one’s life! Bacteria have invaded the nerve space very quickly, causing an ACUTE reaction. This could be an assault by the bacteria on the living nerve tissue for the first time. It could also be a nerve that has died slowly previously and the conditions have change to favour the bacteria greatly. Typically a fresh assault on the nerve is through decay in the tooth reaching the nerve very quickly through a very sugary diet and poor hygiene and food impaction into the cavity. Lots of well fed, cultivated, and home grown bacteria pushed rapidly into the nerve tissue through a cavity that may have been there for weeks. A crack in the tooth due to trauma from a blow or a weakened tooth from previous decay and treatment, can allow a lot of bacteria into the nerve space quickly. If the nerve tissue is still present extreme pain can happen, with tissue becoming very inflamed. In some instances the inflammation makes the nerve so hypersensitive that it is very difficult to numb. In these situations anaesthetic is injected directly in the nerve, if normal anaesthetic injections do not work. The pain occasionally can only be alleviated when the nerve has been removed. When the nerve tissue breaks down the inflammation can increase to cause a build up of blood flow causing a hypereamia. It’s like a blood blister in the root canal. 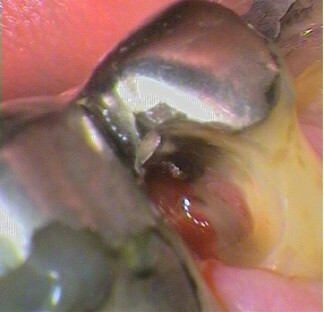 When the root canal is opened, blood is released, and the remaining infected tissue needs to be removed. If the infection is severe enough and the pulp tissue has not only died but has broken down to form necrotic tissue, pus can be formed. Pus is the body throwing its immune system at the dead infected tissue. Pus in an enclosed space is called an abscess. As the root canal system end at the apex of the root in the bone, bacteria pour into the bone space. This causes a build up of pressure, resulting in extreme pain. 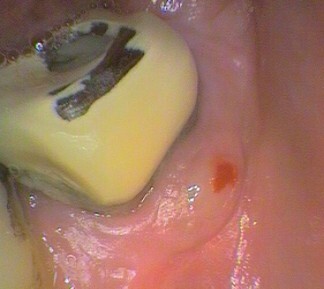 The pain is relieved if the pus can be drained, through the root canal, by cleaning it out. Pus trapped out side the tooth under the gum, causes swelling. Surgery may need to be done to pierce the gum and drain the pus. Pus means dead tissue and loss of structure and blood vessels. Antibiotics will not get at the pus directly as it needs a blood supply, so its important to drain the pus so that healing can occur and blood vessels can regrow. in severe situations hospitalization may be needed as uncontrolled infection can spread rapidly and be life threatening! So PLEASE, PLEASE SEE SEYMOUR DENTAL REGULARLY BEFORE ITS TOO LATE!